In catch-22 traffic emergencies where there are only two deadly options, people generally want a self-driving vehicle to, for example, avoid a group of pedestrians and instead slam itself and its passengers into a wall, a new study says. But they would rather not be travelling in a car designed to do that. The findings of the study, released on Thursday in the journal Science, highlight just how difficult it may be for auto companies to market those cars to a public that tends to contradict itself. Statistically, self-driving cars are about to kill someone. What happens next? Through a series of online surveys, the authors found that people generally approve of cars that sacrifice their passengers for the greater good, such as sparing a group of pedestrians, and would like others to buy those cars, but they themselves would prefer to ride in a car that protects its passengers at all cost. Several people working on bringing self-driving cars to market said that while the philosophical and ethical question over the two programming options is important to consider, real-life situations would be far more complex. Brian Lathrop, a cognitive scientist who works on Volkswagen’s self-driving cars project, stressed that in real life there are likelihoods and contingencies that the academic example leaves out. “You have to make a decision that the occupant in the vehicle is always going to be safer than the pedestrians, because they’re in a 3,000lb steel cage with all the other safety features,” said Lathrop, who was not involved in the new study. So in a situation in which a car needs to, say, slam into a tree to avoid hitting a group of pedestrians, “obviously, you would choose to program it to go into the tree,” he said. A spokesman for Google, whose self-driving car technology is generally seen as being the furthest along, suggested that asking about hypothetical scenarios might ignore the more important question of how to avoid deadly situations in the first place. The problem seems to be how to get people to trust cars to consistently do the right thing if we’re not even sure we want them to do what we think is the right thing. The study’s authors argue that since self-driving cars are expected to drastically reduce traffic fatalities, a delay in adopting the new technology could itself be deadly. Regulations requiring self-driving cars to sacrifice their passengers could move things forward, they write. But, in another catch-22, forcing the self-sacrificing programming could actually delay widespread adoption by consumers. Susan Anderson, an ethicist at the University of Connecticut, and her husband and research partner, Michael Anderson, a computer science professor at the University of Hartford, believe the cars will be able to make the right call. “We do believe that properly programmed machines are likely to make decisions that are more ethically justifiable than humans,” they said in an email. “Also, properly programmed self-driving cars should have information that humans may not readily have,” including precise stopping distance, whether to swerve or brake, or the likelihood of degree of harm. How to get those cars “properly programmed”? The Andersons, who were not involved in the study, suggest having the cars learn from or be given “general ethical principles from applied ethicists”. Dieser Eintrag wurde veröffentlicht in Artificial Intelligence und getaggt mit autonomous car, autonomous driving, autonomous vehicles, Self Driving am 26. Juni 2016 von innovation. The smartphone generation will be perfectly happy not dealing with the expense and hassle of car ownership — why would they when they can order up an autonomous Zipcar with a tap on their iPhone X? Over the past few years, there has been steady progress in the development of self-driving automobiles, and it’s pretty clear that we’re finally on the cusp of this technology going mainstream. As far as I’m concerned, driving is a waste of time, energy, and human life, so I, for one, welcome our autonomous vehicular overlords. The assertion that self-driving cars are on the verge of becoming a practical reality may seem a little bold, but the signs are clearly there. For example, California recently legalized autonomous vehicles, making them now legal in three states (Nevada and Florida are the other two). In fact, in relation to this, Bernard Lu, an attorney for the California Department of Motor Vehicles even went so far as to state that “The technology is ahead of the law in many areas” — and that was back in 2010. And it’s not just some random GeekDad blogger that considers self-driving vehicles to be a near-term probability. GM predicts partially autonomous vehicles by 2015 and fully autonomous vehicles by 2020. Looking even further ahead, the IEEE predicts that 75% of vehices will be fully autonomous by 2040. Simply put, the technology required to make self-driving cars a reality already exists right now. It’s currently expensive, but the cost will drop as economies of scale kick in. So what is the tech that makes autonomous vehicles possible? Well, the poster child for self-driving cars is definitely Google’s ongoing Driverless Car project. At last tally, the Google fleet has driven accident-free for over 300,000 miles (480,000 km), making it clear that the concept is completely viable. Each Google Driverless car is equipped with GPS, radar, video cameras, lidar (laser radar), and a lot of real-time computing power. Basic navigation relies on maps and GPS, with live sensor input to react to real-time changes. The entire setup costs about $150,000, which is obviously well beyond the reach of 99% of drivers, but, as mentioned above, this cost will scale down readily. Another emerging technology that figures prominently in the future of autonomous vehicles is the concept of vehicular communication systems. Obviously vehicle-to-vehicle (V2V) communication and vehicle-to-infrastructure (V2I) communication will make it possible to dynamically route traffic in such a way as to maximize flow and minimize travel times. Say good-bye to traffic jams and road rage, kids. All of the above and more will make the society of the future a very different place than what we’re used to now. That kind of change is likely going to take some adjustment for us older folks, but what about the upcoming generations that will grow up with this? Well, we’re already seeing some signs of a change in attitude there. Of course, there are going to be some bumps in the road on the way to our self-driving future. First up is the usual human resistance to change, though 50% of people surveyed today said they would be comfortable riding in a driverless car. That degree of acceptance suggests a rapid uptake once the technology becomes reasonable in price. Another guaranteed problem is concern about safety. As mentioned before, autonomous vehicles will be far more reliable than human drivers; however, there will inevitably be an accident involving a self-driving car, and the event will be sensationalized by the media. In the end though, the desire to decrease the number of traffic-related fatalities in the world will drive adoption (just for reference, over 30,000 people die each year in vehicle-related deaths in the US alone). From the GeekDad perspective, the most worrisome thing about autonomous vehicles that I can think of is the possibility of vulnerabilities in the software. We have serious issues with exploits in current operating systems and applications — how much riskier will it be when the compromised computer is rolling along at 60mph? Clearly these systems are going to require a level of security that will embarrass today’s military-grade gear. 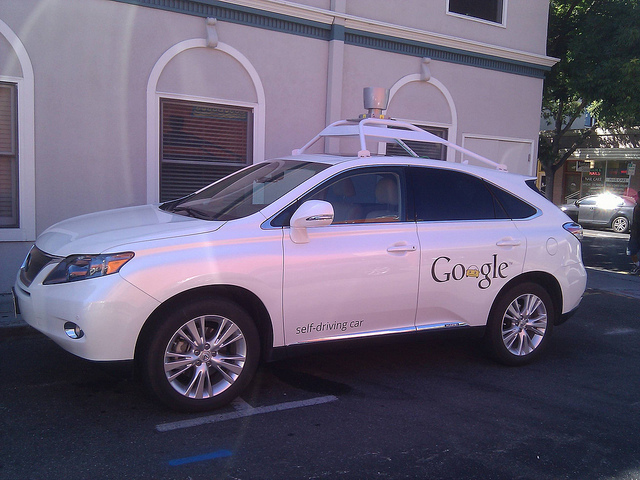 So what are the implications of large-scale adoption of self-driving vehicles? An obvious thought is the corresponding redesign of the road system. Just as we now have commuter lanes, there will undoubtedly be dedicated lanes for driverless vehicles. In fact, eventually the majority of lanes will be reserved for autonomous vehicles, with a few “slow” lanes left over for manually-operated cars and horse-drawn buggies. And if we look even further ahead, eventually it will be illegal to drive a car on public roads. Another anticipated change relates to the fact that driverless cars need not even be “cars.” Vehicles of the future won’t necessarily just transport humans, so there will likely be a wide spectrum of designs, from large cargo transports to small pizza delivery mini-mobiles. Of course, the technology behind self-driving cars will transfer easily to trains, streetcars, subways, ships, and possibly even aircraft (though that last one makes me a little nervous). As with any other labor-saving advance in technology, an inevitable consequence of autonomous vehicles will be the elimination of a lot of jobs. Yes, there will be new jobs created to build and service these vehicles, but I’m pretty sure that far more jobs will be eliminated than created. In theory, this should mean that the overall efficiency of the system is increased, and humans will have increased time available to do more valuable work; in practice though, the transition involves a lot of disruption. The signs are clear: autonomous vehicles are coming. The technology is already real, and it’s just a matter of scaling down the cost. Once that happens, there will be rapid adoption of driverless automobiles that will result in a complete redefinition of travel. Yes, there are some negatives to this impending transition, but overall, the shift to self-driving vehicles will be a net-positive for society. And If you’re interested in autonomous vehicles, be sure to check out Brad Templeton’s Robocar page. Dieser Eintrag wurde veröffentlicht in e-mobility, Innovation und getaggt mit autonomous, autonomous driving, autonomous vehicles, california department of motor vehicles, driverless car am 9. Januar 2013 von innovation.